Our nursery is available for infants through toddlers during the Bible Study/ Sunday School hour (9:45 AM) and our Worship Celebration (11:00 AM). Our nursery volunteers love to minister to our children during these times when our church gathers for Bible Study and Worship. Your child can participate in age graded, small Bible study groups with the same teacher every week. In this small group, they will build relationships with the teacher and other children. Your child’s understanding of the Bible will be expanded and they will learn how to apply it to their lives. Wednesdays throughout the school year from 6:30 - 7:30 PM. 2019 Session BEGINS September 11th. Click HERE to register online. 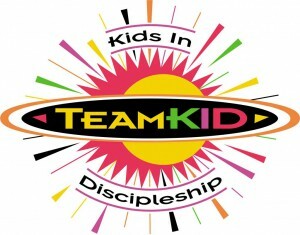 TeamKid is a Scripture-based club for children Grades 1st-6th that balances high-energy activities and games with high-impact Bible lessons, Scripture memorization and life application.